I love Marcella Hazan's bolognese sauce so much I want to rub it all over my body, which is why it's a mystery why I don't keep vats of it on constant rotation in my fridge or freezer. This sauce is amazing on pasta -- and you could eat that combination every day of your life and be completely content -- but I am particularly fond of pairing the bolognese with shell beans. This is one of those picky eating tricks I've executed over the years to get me to like something I didn't like: combine disliked food with loved components/ingredients. Though I (and a lot of other kids) did/do this with ketchup, others might drown things in cheese sauce, and still others pull out the bacon for maximum food acceptability. Whatever it is for you, as a professional former picky eater, I have found that highly flavorful sauces and vinaigrettes work really well for me, as do strong ingredients: garlic, herbs, spices, and hard cheeses used as seasoning. Freshly grated, Parmigiano-Reggiano gets used around here like salt. I apply two personal tweaks to Hazan's master recipe: I use 100% ground pork instead of her advised beef-pork mixture, and I substitute rosé or red wine in the place of white. Play around with it and see what you like. Personally, I'd be curious to try a ground lamb/Barolo combination in the future. 1. Put oil, 3 tablespoons butter and chopped onion in a heavy 3-1/2-quart pot and turn heat to medium. Cook and stir onion until it has become translucent, then add chopped celery and carrot. Cook for about 2 minutes, stirring vegetables to coat well. 2. Add ground beef, a large pinch of salt and a few grindings of pepper. Crumble meat with a fork, stir well and cook until beef has lost its raw, red color. 3. Add milk and let simmer gently, stirring frequently, until it has bubbled away completely. Add a tiny grating, about 1/8 teaspoon, fresh nutmeg and stir. 4. Add wine and let it simmer until it has evaporated. Add tomatoes and stir thoroughly to coat all ingredients well. When tomatoes begin to bubble, turn heat down so that sauce cooks at the laziest of simmers, with just an intermittent bubble breaking through the surface. 5. Cook, uncovered, for 3 hours or more, stirring from time to time. 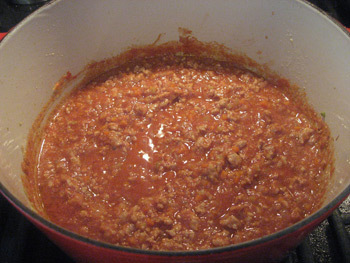 While sauce is cooking, you are likely to find that it will begin to dry out and the fat will separate from the meat. To keep it from sticking, add 1/2 cup water as necessary. At the end of cooking, however, the water should be completely evaporated and the fat should separate from the sauce. Taste and correct for salt. 6. Add remaining tablespoon butter to the hot pasta and toss with the sauce. Serve with freshly grated Parmesan on the side. 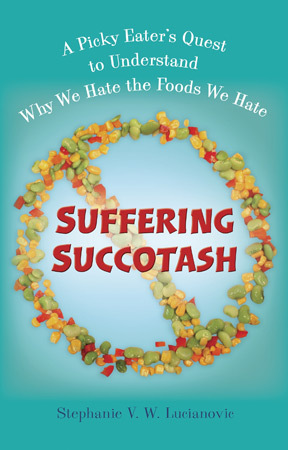 Having long felt that beans were tasteless pellets of mealiness that sucked all flavor out of my mouth as soon as I bit into them, I have searched high and low, not just for recipes and techniques that confound that flavor-sucking outcome, but also for my perfect bean. My current beans of choice are tiny, white tender Alubia Blanco from Rancho Gordo. I currently have four 1-lb bags of these in my pantry, which means I'm running low. Cooking method: The cooking time for beans can vary depending on power of stove, age of bean, and pot. Using my 7 1/2-quart Le Creuset Dutch oven, I submerge half a pound of Ayocote Blanco beans in water that covers the beans by two inches and soak for an hour before cooking. Then I slick the water surface with 2 tablespoons of good olive oil, bring the pot to a boil, and lower the heat for a covered simmer that lasts about 1-2 hours. Start testing for bean doneness an hour into the process, and cut the heat when you reach your desired tenderness. I like my beans more creamy than chalky, but it's up to you to decide on your preferred texture. TIP: allow the beans to cool off fully on their own. If you drain them before they and their cooking water have come to room temperature their skins will split and wrinkle. Now for the good part: put the cooked beans and sauce together and just finish with a few pinches of crunchy Maldon sea salt and grated Parmigiano-Reggiano cheese. Is it one cup of sauce per one cup of beans? Maybe. Is it 2 cups of sauce per one cup of beans? Sure. This proportion is totally up to you. When trying to like a food it's better to have a higher ratio of the element you like (the sauce) to the thing you don't like (the beans, in this case). Why? Well, this essentially tricks your brain into believing that if you like most of what you're eating, than that small component of what you don't like must be okay as well.